Mathew Street was once the epicentre for all of Liverpool’s finest freaks and seekers. It included The Cavern from where The Beatles launched themselves to global stardom. Eric’s club opened here in 1976 with bands like The Stranglers, The Runaways and The Clash. From Eric’s emerged Big In Japan which included Bill Drummond who went on to form The KLF with Jimmy Cauty. Carl Jung dreamed of a round pool in Liverpool and declared that ‘Liverpool is the ‘pool of life.’ The poet Peter O’Halligan identified the location of the the ‘round pool’ as a cast-iron manhole cover in Mathew Street. He rented the warehouse overlooking the drain, and opened the Liverpool School of Language Music Dream and Pun. Bill Drummond became obsessed with the manhole cover, imagining that it was the ‘fulcrum of an interstellar ley-line’. Over the years the creativity of the street gradually faded and a cultural plague reduced the area into a husk of its former self, beset with soulless tourism. 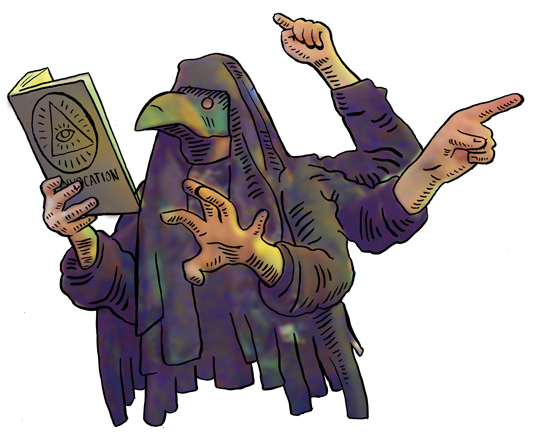 This is why is was decided the bad spirits would be exorcised from the pool of life, and once it has been cleansed of the corrupting influence, the undercurrents will flow beneath the manhole cover freely allowing for a new cultural era for Liverpool. 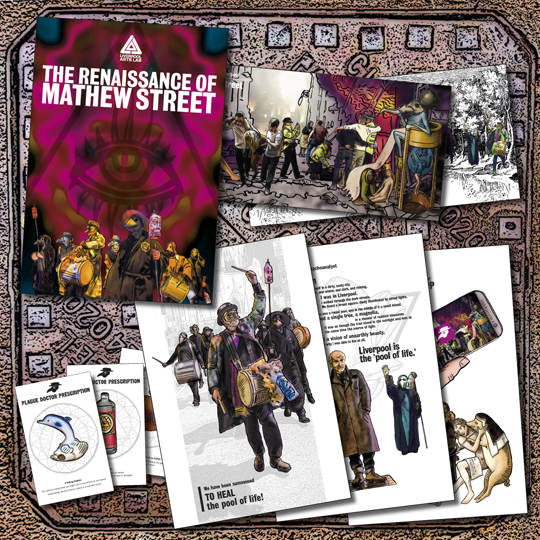 This book provides an illustrated introduction to the cultural significance of Liverpool’s Mathew Street and follows the cleansing ritual of the plague doctors summoned by Liverpool Arts Lab. The package contains posters, inserts and a fold out replica of the manhole cover. Fold it out, stand on it, and feel the energy of the mega-powered interstellar ley line.